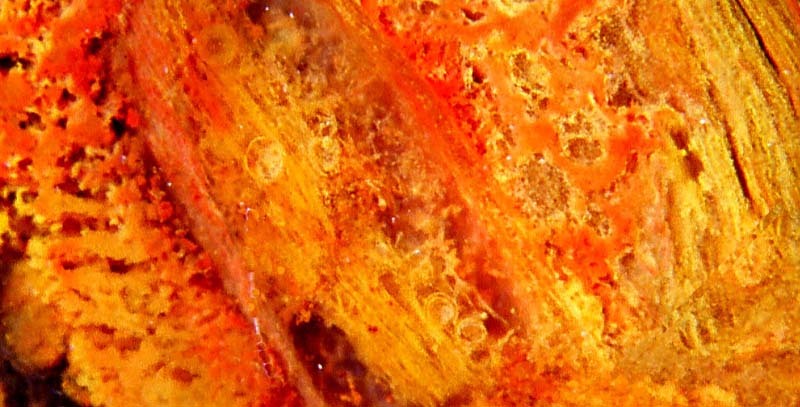 For variuos reasons, fossil fungi are rare despite of the fact that they had been helpful to plants when they occupied the dry land in the Silurian and Devonian . As an exception, the Rhynie Chert (Lower Devonian) is famous among biologists for the excellent preservation of hyphae and "chlamydospores" of several fungi. Only a few of the expected numerous palaeozoic fungus species have been found well preserved in chert, and only part of them have been scientifically described. Some lived as symbionts or parasites, others lived on decaying dead plant tissue, also in the swamp water where they occasionally formed extended tangles of branching hyphae. With silica-rich swamp water turning into gel and finally into chert, the hyphae became silicified. Cherts from Germany have yielded very few fungi. It can be expected that some of the numerous chert samples recovered from Döhlen basin (Lower Permian), superficially or not yet inspected hitherto, will provide a few more specimens. Hyphae within quartz crystals (Tertiary) have been found near Warstein . A peculiar fact may be mentioned here: A particular kind of wood rot with hyphae filling the wood cells with profusely branched "arbuscules" has been described by several palaeobotanists, with increasing zeal, as oribatid mite coprolites in petrified wood. 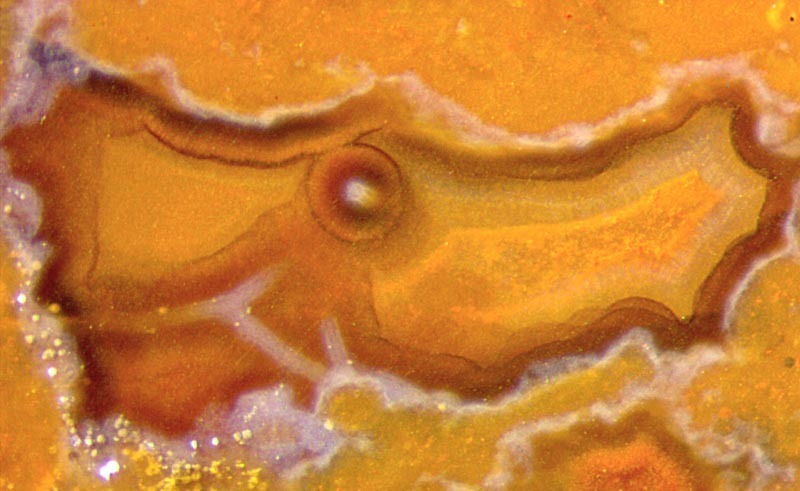 Fig.1: Chalzedony, formerly water-filled cavity with poorly visible fungus hyphae, diameter <10µm, with pale coating, about 25µm, and brown coating, 170µm. 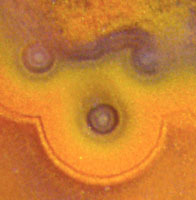 Picture width 1.4mm. The lower pH inside decaying plant parts in silica-rich water favours silica gel formation there first. Subsequently, coatings may be formed. Fungus hyphae often thrive in the remaining water-filled cavities. They become coated with silica gel, eventually with several layers due to changing parameters, as temperature. The concentric layers may appear as pale in clear vicinity or clear in pale vicinity, for example (Fig.1-3). The coated hyphae may bend down under their own weight. Coated needle-shaped crystals and mineral formations like those in moss agate are liable to being confused with hyphae. 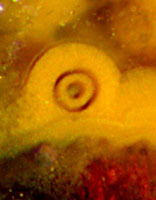 Long straight parts ending at branching sites are absent in moss agates, and curved parts are absent with crystal needles (Fig.1). Fig.2,3: Multiply coated fungus hyphae, height of the pictures 0.35mm, same scale as Fig.1. 10, 14, 22, 28, 40, 48, 110, 125, 145(?). Fig.4 (below): Tree fern frond stalk, largely decayed and silicified while lying in swamp water, indistinct tangle of poorly preserved fungus hyphae in some places, 4 (or more) spherical chlamydospores, cut or transparent, empty, thick microbial cover (cyanobacteria ?) on the left. Width of the picture 5.5mm. Fungus hyphae are rare in the cherts of the Döhlen basin. Probably they decayed before they became coated with silica gel. The comparatively big spherical chlamydospores, which possibly guarantee survival after decay of the hyphae, are another feature revealing the presence of fungi. They are not easily seen among the debris in Fig.4. Here, the wall of the chlamydospores is apparently not much stained by the abundant yellow or red iron oxides deposited from soluble iron compounds. Samples: Döhlen basin, Lower Permian. cut and polished by H. Albrecht, label Bu7/207. Fig.4: own find, Hänichen, Käferberg; own collection, label H/333.1 .